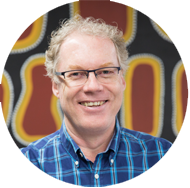 Having lived and worked in Kununurra for over 17 years, Allan brings a wealth of governance experience from various Indigenous organisations based in the Kimberley and Pilbara regions. Originally from South Africa with a background in civil engineering, Allan moved to Kununurra in early 2000 to oversee a number of remote Aboriginal community projects. Allan has significant project management experience, being instrumental in negotiating the Argyle Diamond Mine agreement whilst working at the Kimberley Land Council, as well as significant experience in corporate governance, the not for profit sector and business administration.